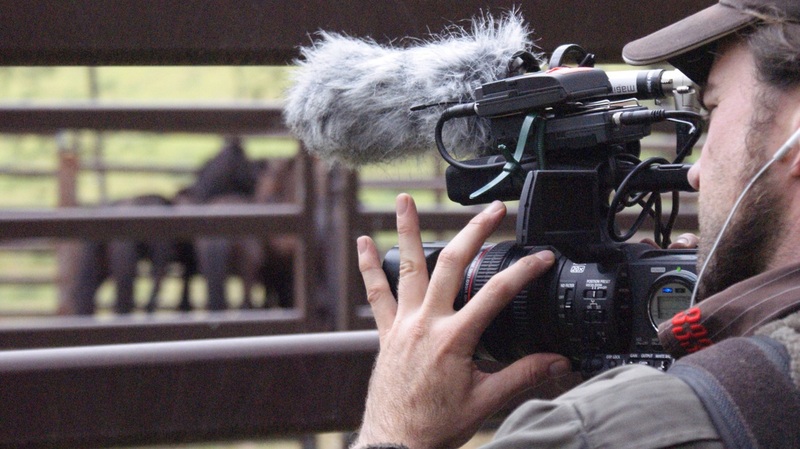 Russell Kilbey spent 3 years filming Luke Carlon and his crew of stockman as they tried to capture and relocate the Brumbies of the Burragorang. I first met Luke Carlon at a meeting we were having with the NPWS head office to try and convince them it would be a good idea to film the capture of the last mobs of wild horses in the Blue Mountains National Park. Luke didn’t say much, smiling and looking out of place in his old flannelette shirt amongst the rangers and smartly dressed bureaucrats from the NSW department of Environment . Brumbies or wild horses are a very sensitive issue for the Parks Service as some years back the culling of a group of horses in the Guy Fawkes National Park using helicopters had caused a public relations disaster and a government inquiry. Those were the bad old days and the service was keen to show that they were now committed to removing and relocating the horses as humanely as possible. After consultation with various interest groups from the Brumby Preservation Society to the bushwalkers, environmentalists and local cattlemen Luke was offered the task of trying to capture these wily animals. It would be no easy job. The horses were rumoured to be the descendants of pit ponies used to work the silver and shale mines in the area, set free when the mines closed down. They had roamed the area around the Coxs river for over a hundred odd years. Since the graziers and guesthouses were moved on and the area was flooded to create Lake Burragorang in the late fifties they had the Lakes foreshore and wooded hills and gorges all to themselves. There were estimated to be about sixty of them roaming in small mobs over an area of hundreds of square kilometers. To complicate matters the whole area they roamed was both a highly restricted water catchment and a declared wilderness area so the operation had to take place with as little human impact as possible. Ironically all of the transport except for some heavy lifting by helicopter, would be on horseback. Horses have been trapped and removed from other National parks but always with the luxury of roads or at least four wheel drive access. Historically the Burragorang Valley, only 80 kilometers from Sydney CBD was always a difficult place to access which is why it was settled by Irish rebels and not a few bushrangers. Since the valley was drowned there was only a couple of rough fire trails left. Luke said plainly that the safety of his crew and the animals would always have to come first and pointed out that a documentary crew would be an extra burden he didn’t really need. I assured him that I was used to sleeping rough and didn’t mind walking in the bush even if it meant carrying all the camera equipment on our backs. He looked at me quizzically. I tried to hide my soft city hands. A few months later, after a bone jarring hour and half in Luke’s ancient Bedford truck, our horses on the back, we pulled into a small clearing. This was at Hays Crossing, Cedar Creek in the forbidden Burragorang Valley and this was to become base camp for the horse relocation project for the next year. Luke had already set up a small camp that looked like something Ned Kelly would have left behind. As we saddled up our horses I mentioned I hadn’t ridden for quite some time, I heard an expression I was to hear many times over the next couple of years- ”You’ll be right, mate”. Soon we were riding in the forest, a beguiling mixture of myrtles, black wattle and sassafras draped in native passionfruit and lawyer vine with small rocky creek crossings on a track that Luke had cut through over the last month or two. I followed behind Luke and his packhorse which was loaded up with six hessian bags of feed, on a sturdy old horse called Smokey. Besides the barbs of the lawyer vine, the spikes of the blackthorn and the jagged rocks underfoot this wasn’t too bad I thought. Without warning Luke’s packhorse went berko, ploughing the ground, kicking over several medium sized trees and sending twenty kilo bags of feed flying through the air like crash test dummies. I sat petrified and in awe of the strength and power of this enraged beast as Luke cursing, tried to settle the animal back down. Eventually the horse quieted and we surveyed the damage. Broken straps and crupper and a snapped WW1 red cedar pack saddle and bags of feed all over the place.. I was only glad I was blameless. As Luke attempted to repack the horse with straps borrowed from the other horses I realised how far I was from the latte belts of Sydney and how much my life depended on the skills of this bushman and his trusty (and not so trusty) horses. Luke had a walkie talkie with him to call in a helicopter if one of us was seriously injured but as the reception seemed patchy we were essentially alone. We followed the trail up and down steep embankments along the creek for about 4 kilometers until we reached the Coxs river. This was about 150 meters across at this stage and due to the massive amount of silt backed up by the dam, full of bogs and quicksand. We gingerly picked our way across the river shoulder deep in places, moving quietly as on the other side was a beautiful remnant paddock known as Appletree Flat. This Luke told me was a favorite haunt of the brumbies. In hushed tones Luke told me about the first time he had seen the brumbies on Apple tree Flat.. When he was a teenager he had snuck into the park and liloed down the Cox one hot summers day with his best friend Adam Boyd. He’d heard rumours about this place where the horses ran free but couldn’t believe his eyes when they washed up on shore. It must of seemed like brumby paradise. We sneakily led our horses into a wide idyllic clearing surrounded by steep densely wooded hills. A mob of about twenty black ponies stood watching us. They seemed in beautiful condition, their coats shining in the sinking winter sun. I filmed them trying not to breath too hard and shake the camera. This was our quarry and I felt a strange mixture of excitement and sadness seeing them in this Arcadian state. Were we the first humans they had ever seen? A big stallion pranced around closer, snorting, trying to work out whether we were rivals or more mares for his harem. This was a question that dogged me the entire time. Were we friend or foe? There is something extraordinary about wild horses, something primeval that’s still in our DNA. We were hoping to catch these animals, break them in enough to lead them out of this quiet and untouched valley where they would be found caring homes in fenced paddocks and ridden to pony club. Yet they would lose their freedom and innocence and that seemed like some sort of violation of the way things had been in this secluded spot for some time. Still it was a whole lot better than the offered eventual alternative. Under the Wild horse management plan if Luke failed to catch these horses they were to be shot. Game over. The big stallion snorted at us and then led the whole group on a slow canter up into the safety of the rugged hills behind the flat. He probably knew no mounted horse could follow him through the thick scrub, along trails only known to the wild horses of the Burragorang. Luke pulled off a bag of feed and started to pour it out. Unlike domestic horses the brumbies weren’t really interested in this mix preferring natural grass and even lamandra. In the Snowy Mountains the horses were attracted by salt licks. Here the horses didn’t need it. Didn’t think much of molasses either. Before Luke could even think about building a trap to catch these wild horses he had to work out what to bait it with. Then cart it in week after week after week on pack horse. This would be no easy job for Luke, but for this soft handed city fella, the adventure of a lifetime. The Man from Coxs River has had over 140 screenings all over Australia and has just been picked up by Event Cinemas.